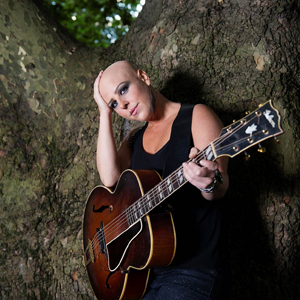 Brooklyn born but living in Notting Hill, Nell Bryden is clearly practiced in her art. With three albums already under her belt, she is heralded by artists like Jools Holland and even spent the majority of 2013 supporting Gary Barlow’s solo UK tour. Before the gig, I made sure to listen to her most recent album on Spotify: I was already impressed and wondered if her voice could be just as impressive in front of a live audience. Prior to this gig, I was an EVAC virgin but was immediately charmed by its decor and ample size – perfect for Bryden’s powerful sound, a sound that never scrubbed a note. Bryden’s setlist itself varied in genre, mixing loud pop-rock tunes like ‘’Second Time Around,’’ which drew comparisons to the likes of Annie Lennox, with softer acoustic country such as ‘’Wolves,’’ which was not only emotional but also reminiscent of Colbie Caillat. I think at live shows, the best way to gauge a good live act is how well they interact with their audience, not only through the music, but also through their chit-chat and general stage presence. Despite being heavily pregnant, and having been victim to a robbery the night before (a story still told with humour), Bryden struck me as courteous and ever-grateful to her audience. Some of my favourite moments of the gig, apart from Nell’s down to earth anecdotes that almost made her seem like a maternal figure to the audience, were the moments she spent talking about her band. Too often artists can become superior to their bands and fail to give them the acknowledgement they deserve, but this was never the case with Nell. A final point here, would be that Nell is an artist who is attractive to a range of ages. EVAC was filled with everybody and anybody, from bopping students to middle aged couples enjoying an evening of pure talent (a special mention should also go to bassist, Lorne Ashley, for having seemingly unlimited energy throughout the show). Credit is also reserved for the two supporting acts; acoustic guitar-wielding Emilio Pinchi, who resembled the sounds of Jake Bugg (without the Nottinghamshire drawl) and Blair Dunlop, established already in his own right, also delivered an enjoyable folky sound during his set. A strong evening all round, topped by an act who proved beyond doubt that she is at the top of her game.